The pre-Congress gathering of indigenous leaders, E Alu P&umacr;, brought together 150 participants from across Hawai‘i and over thirty countries for a four-day cultural exchange. Several CTAHR faculty participated in the International Union for Conservation of Nature (IUCN) World Conservation Congress, held in September in Honolulu, where they shared research on everything from Rapid ‘Ohi‘a Death to agroecology to native bees. Before the Congress began, though, other members of the college helped to set the tone for the international event. Dr. Mehana Vaughan, assistant professor in the department of Natural Resources and Environmental Management (NREM), along with NREM students and alumni, participated in a pre-Congress gathering of indigenous leaders, E Alu Pu. 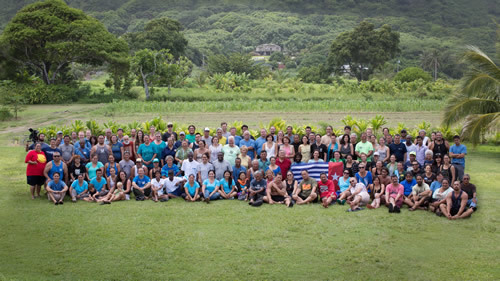 This gathering brought together 150 participants from across Hawai‘i and over thirty countries, as far away as Madagascar, Canada, Vanuatu, and Peru, for a four-day cultural exchange. E Alu P&umacr;, which means “move forward together,” reflects the spirit of collaboration fostered by the event. The nonprofit organization Kua‘&amacr;ina Ulu ‘Auamo convened the gathering and partnered with NREM, the Nature Conservancy, Hui ‘&Amacr;ina Momona, and UH Sea Grant to facilitate group discussions. 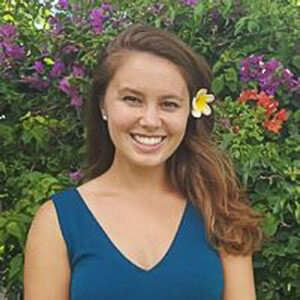 NREM alumna Molly Noelaniokekai Mamaril participated in E Alu Puand wrote about the experience. One of the participants was Molly Noelaniokekai Mamaril, who earned her MS in 2014 and currently works as an assistant project manager at Pono Pacific Land Management. She was joined by fellow NREM alum Pua‘ala Pascua and NREM students Emily Cadiz, Cheryl Geslani-Scarton, Amy Markel, Monica Montgomery, Kanoe Morishige, Jordan Muratsachi, Aissa Yazzie, and Kawela Farrant. Participants took part in a traditional Hawaiian ‘aha ‘awa ceremony and in discussions focused on preserving indigenous culture and fostering community stewardship of local lands and waters. They shared struggles with the loss of native lands, over-regulated harvesting rights, and pressure to westernize the management of local resources, as well as success stories of reclaiming access to resources, building local trade economies, creating strong partnerships, and empowering youth. Many stories emphasized the importance of community-based natural resource management. The group also worked together on a restoration project at Huilua fishpond in Kahana, putting ideals into action. An important theme of the gathering, later echoed by IUCN members in their adoption of key measures supporting indigenous peoples’ rights, was the need for policy to be founded in the collective wisdom and experience of communities who understand how to sustainably manage their local resources. “Worldwide, communities who have long depended upon their land and waters for sustenance are critical partners in ensuring the health of natural resources for future generations,” maintains Dr. Vaughan. See http://kuahawaii.org for more information.